BOB ABERNETHY, anchor: It’s rare on this program that we get to listen to a conversation between two prominent spiritual teachers. Earlier this year, in Northern California, producer Kate Olson sat in on just such an event. 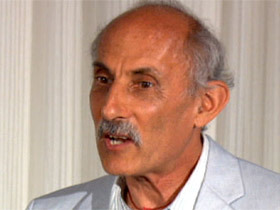 Jack Kornfield is a prominent Buddhist leader. 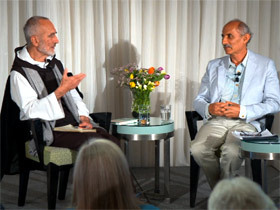 David Steindl-Rast is a well-known Christian, a Benedictine monk. Their topic was living gratefully. BROTHER DAVID STEINDL-RAST (speaking at event): Gratefulness is there from the very beginning, because it is always a loving listening to whatever comes your way, and if you lovingly listen to it, you are grateful for it. It has these three steps that we have talked about many times: the stopping, the looking — opening your heart in every respect — and then the doing, the responding. And all three must come together. STEINDL-RAST: Well, the stopping is the first step towards it, because otherwise I get carried away. I’m in a rush. Our life is a rush, whether you are a monk or you are an executive. KORNFIELD: Monks rush. You gotta get this. You’re in good company. STEINDL-RAST: I think you come to the practice through the fact that gratefulness happens to you. Two things have to come together: something has to be valuable to you, and you have to become aware that it’s given to you. Then spontaneously in everybody’s heart, gratefulness arises. And then you see, “Ah! This feels so good!” You see? This is a joy. This gives us joy. But then you have to make one more step to really make this joy permanent or at least accessible at every moment, and you have to realize that every moment is such a gift. Immediately, of course, people ask, “Can you really be grateful for everything?” And the answer is no, you can't be grateful for everything. But I didn’t say you can be grateful for everything. I said you can be grateful in every moment, because in every moment an opportunity is given to you. And the gift within every gift is opportunity. So opportunity, that is the decisive thing. And when you stop, you realize the opportunity that is now given to you. Unless you stop, you will never realize this opportunity. STEINDL-RAST: … or the opportunity to stand up and be counted and protest and demonstrate. STEINDL-RAST: Most of the time it’s the opportunity to enjoy. 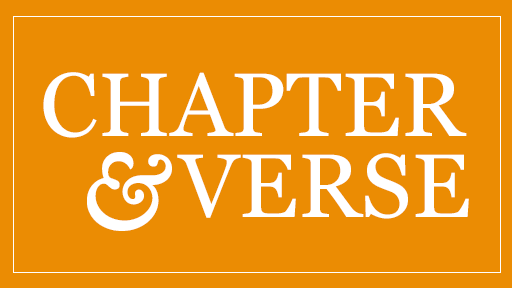 KORNFIELD: One of the things that I’ve learned for myself over the years of meditation, my own meditation practice has gotten quite simple, really. I do it not to get anywhere. I’ve been a lot of places, and thank you, that’s great, but I sit sometimes to clear out, because I get too busy and my body gets a little tense and I get filled with too many thoughts and so it’s sort of like flossing or something like that. Seriously, you know what I mean! It’s a clearing. And then it’s more about being, because there is only one place to be, which is where you are, where we are now. And the other thing that seems really important is that spiritual life can easily become mapped in our heart somehow with grim duty, or some kind of thing that you have to do to fix yourself, right? You go to the gym, and you jog, and you get therapy, you know, and you do your meditation, and you diet properly, and things like that. There are disciplines that are worthwhile, but if the discipline doesn’t have some love in it, it’s really not going to serve you. Somebody said the question is not the future of humanity but the presence of eternity. And the invitation of meditation and the joy that you talk about is more allowing ourselves to shift from doing to that quality of – I called it loving awareness, gratitude, sacred presence – to the mystery of being here. STEINDL-RAST: And this underlines an important fact, namely that this stopping is an expression of your trust in life. STEINDL-RAST: When we trust life, then we go with the flow. Then life will give us one opportunity after another. We have this saying, “Opportunity knocks only once.” I don’t know who invented that. It’s the most stupid thing in the world! Opportunity knocks every moment, and if you miss this opportunity, there’s another one. And if you miss this one, another one! Life is overflowing, so abundant, gives us one opportunity after the other. What you see when you “stop” and “look” is opportunity. Whatever the opportunity may be. And if you take that opportunity, that’s the goal. Before that, gratefulness isn’t really full. It’s full when you give thanks. And you give thanks not by saying thank you, obviously, but by doing something with the opportunity that is given to you. And we can try it out. If you make up your mind, “I will be a little stop, look, go from now until tomorrow morning,” I can assure you tomorrow morning, you will be more joyful. It works. It’s just a matter of trying it out. And if we become more joyful people, that’s all that is asked of us. We don’t have to change the world. If there are enough joyful people, there will be a more joyful world. And that’s really how it works.